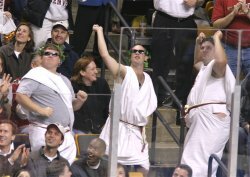 The Denver Pioneers host the most famous athletic brand name school in America when the Notre Dame Fighting Irish come to town for the 2008 U.S. Hockey Hall of Fame game this Saturday. The last game the Irish played was in Denver, but not against the Pioneers, when the Irish lost the 2008 NCAA title game against fellow Catholic school rival Boston College at Denver’s Pepsi Center last April. Denver has played the Irish 57 times since the first series in January of 1971 when the Pioneers defeated the Irish, 6-3 and 4-2. The Pioneers sport a 34-10-3 lifetime record against ND, including a split series in South Bend, Ind. last year. This year’s Irish team is ranked #4 in both national polls (USCHO and USA Today). The CCHA coaches’ poll picked the Irish to win the league, while CCHA media picked Notre Dame to finish second (after Michigan). Over 80% of the Golden Domer’s goal-scorers return, including pre-season all-CCHA forward Erik Condra, who bagged 38 points last season, and one of the nation’s premier offensive defensemen, junior Kyle Lawson, who added 26 points from the blue line last season. Goaltender Jordan Pearce returns as well, and Pioneer fans should also look for co-captain Christian Hanson, who finished strongly last season for ND, and whose father, Dave, was an ex-NHLer who starred as one of the Hanson Brothers in the famous 1977 hockey cult movie classic, Slap Shot. Notre Dame began playing sporadic varsity hockey on the lakes of South Bend from 1912-1927, often led by ND football players. 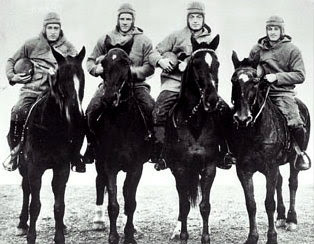 In fact, one of the Irish’s best goaltenders in those early years was Jim Crowley, who later became immortalized as one of the “Four Horsemen” -- a famous Notre Dame football backfield of the early ‘20s. Crowley’s hockey career was cut short by famed Notre Dame football coach Knute Rockne, who wanted Crowley on the football field and not the ice. He later became head football coach at Michigan State and Fordham, as well as commissioner of the All-America Football Conference, an early pro football league. After a long absence from campus, due to a lack of indoor ice facilities, Notre Dame began to get serious about hockey again in the 1960s. 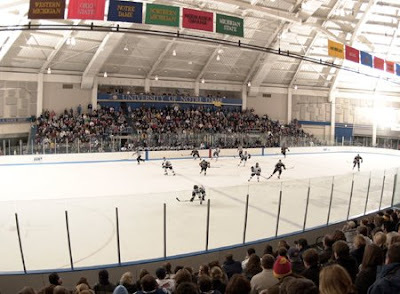 Under coach Lefty Smith, a new 2,800-seat hockey arena was constructed as part of the Joyce Athletic and Convocation Center, the twin domed sports complex that the Irish have called home ever since. Smith still works at Notre Dame, as manager of the arena. Irish hockey returned at the varsity level in 1968 for three independent D-I seasons and joined the WCHA in 1971-72, where it remained until 1980 with only a couple of winning seasons. At that time, the Irish (along with fellow WCHA members Michigan, Michigan State and Michigan Tech) all jumped to the geographically closer CCHA to combat rising travel costs. Notre Dame played in the CCHA for a couple of seasons, but financial pressure forced the program to drop to club status until 1988, when it resumed as a varsity D-I independent with the intent to join the CCHA in 1992, where it has been ever since. "When I first took over here, I thought it would probably take five years before we could actually get to this pinnacle," Jackson told the Ann Arbor News last year. With an appearance in last year’s NCAA final game, it is clear Notre Dame is going to be a force for some time to come -- especially when the old Joyce ACC arena is renovated in the coming years. Over the years, Notre Dame grew just outside South Bend, Indiana, to become one of the great bastions of American Catholicism, bolstered in national fame by the arrival of legendary football coach Knute Rockne in 1918. Rockne won 88% of his games, including six national championships and five undefeated seasons, creating a football program that put Notre Dame on the athletic map during the golden age of American sports. Rockne innovated the game with popularization of the forward pass, and Notre Dame was made even more nationally famous by legends such as the “Four Horsemen”, “the Gipper” (George Gipp) and the famous school fight song. At a time before television, Notre Dame became the first national college athletic brand, helped along by the gradual acceptance of American Catholics into mainstream society at that time, many of whom identified with Notre Dame’s success and remain today as “subway alumni”. Today, the University is seen by many as America’s finest Catholic University, with about 11,000 students, 8,000 of whom are undergraduates, and about 80% of whom identify as Catholic. For many years limited to men, Notre Dame became co-ed in 1972. The Notre Dame endowment was worth $6.5 billion in 2007 -- 14th largest among US colleges and universities. To get a flavor of Notre Dame, one need only rent the movie Rudy (1993) which details the true story of football walk-on Daniel “Rudy” Ruettiger. which was filmed with Notre Dame’s cooperation. True Notre Dame fans also weep during Knute Rockne, All American (1940) which stars Ronald Reagan as the dying football star George Gipp. The Notre Dame campus is located in Notre Dame, Indiana, an unincorporated northeastern suburb of the city of South Bend, Indiana, about 90 minutes from Chicago by car or train. South Bend has a city population of 107,000 and a metro area population of 313,000. Best known now as the home of Notre Dame, South Bend was a fur trading post on the St. Joseph River in the 1800s and later became a powerful manufacturing city in the 20th century. South Bend peaked in the 1950s and 60s, when up to 130,000 people called it home -- including the headquarters of Studebaker Automobiles, which closed in 1963. Since then, the area has been transitioning into an economy dominated by education, health care, and small business. Probably the most famous resident of South Bend is Schuyler Colfax (1823-1885) the editor of the South Bend Free Press who later went on to become Speaker of the House and Vice President of the United States under President Grant in the 1870s. Colfax later became the namesake of Denver’s major east-west avenue, and in another odd twist of fate, died of a heart attack in Mankato, Minnesota after trying to walk between two train depots when it was -30 degrees outside. It is not clear how Notre Dame's athletic nickname, "Fighting Irish," came to origination. According to the Notre Dame web site, it may have even begun as an abusive expression tauntingly directed toward athletes from a small, private Catholic institution, although they also suggest that a more generally accepted explanation lies elsewhere. According to Notre Dame, “the press coined the nickname in the 1920s as a characterization of Notre Dame athletic teams, their never-say-die fighting spirit and the Irish qualities of grit, determination and tenacity” (likely part of the heritage of the Irish Brigade of immigrant soldiers who fought for the Union during the Civil War). Notre Dame had competed under the nickname "Catholics" during the 1800s and became more widely known as the "Ramblers" during the early 1920s in the days of the Four Horsemen, when Notre Dame was known to play teams far away from campus. Notre Dame alumnus Francis Wallace popularized the term “Fighting Irish” in his New York Daily News columns in the 1920s. University president Rev. Matthew Walsh officially adopted "Fighting Irish" as the Notre Dame nickname in 1927. The Notre Dame leprechaun was named the official mascot in 1965. It features a side view of the figure with his dukes up, ready to battle anyone that comes his way. Although the original logo dates from the mid 60s period, it has been updated slightly in recent years. The live version is a student, chosen annually at tryouts, dressed in a cutaway green suit and Irish country hat. The leprechaun wasn't always the official mascot of Notre Dame. For years the team was represented by a series of Irish terrier dogs. The interlocked ‘ND’ letters also date from the 1960s. Note that The University of North Dakota also uses a similar interlocking ND letters to Notre Dame, but the North Dakota letters must, according to North Dakota’s graphic standards, be identified as North Dakota (as above), whereas Notre Dame’s letters do not require additional identification. Although Notre Dame’s official colors for athletics have long been listed as gold and blue, the color of the Irish home football jersey has switched back and forth between blue and green for more than 50 years. The hockey team tends to stick to blue and gold. One of the most recognizable collegiate fight songs in the nation, the "Notre Dame Victory March" was written by two brothers who were Notre Dame graduates. Michael J. Shea, a 1905 graduate, wrote the music and his brother, John F. Shea, who earned degrees in 1906 and 1908, wrote the words. The song was copyrighted in 1908 and a piano version, complete with lyrics, was published that year. Notre Dame has an impressive list of alumni, including many in politics, perhaps the most famous of whom is fellow University of Denver alumnus Condoleeza Rice, current US Secretary of State. Rice earned her BA at Denver, went to Notre Dame for her master’s degree, and returned to Denver for her Ph.D. Notre Dame has also produced 16 members of Congress over the years, including William Miller, who was Republican Barry Goldwater’s Vice Presidential running mate in the 1964 US election. Notre Dame also produced Bruce Babbitt, former Arizona governor and Secretary of the Interior. Media is another strong suit of Notre Dame alumni, where TV hosts Regis Philbin and Phil Donahue are alums, as are sports journalists Red Smith, Don Criqui, Hannah Storm and Ted Robinson. But of course, Notre Dame’s best known sports alumni are probably in fooball (Knute Rockne, Joe Montana, Paul Hornung, Charlie Weis) and Carl Yazstremski in baseball, while hockey fans would recognize some the 14 Irish players to play in the NHL, including Dave Poulin, Jack Brownschidle, Mark Eaton, Bill Nyrop and Yan Stastny, brother of former DU Pioneer all-American Paul Stastny. Notre Dame comes to Denver without having played an exhibition game yet this year, so it’s difficult to predict how this team will perform. But as the fourth-ranked team in America, we can all assume the Irish will be very, very formidable opposition for the Pioneers. The Pioneers would probably like to establish the tone early and capitalize on the fact that the Irish have not played a game this year, and that it may take Notre Dame a little while to find their game timing. If the Irish are anything like last year’s NCAA finalists (and many of those players return), the Pioneers can expect a strong forecheck and excellent, experienced depth at all positions. I think the teams likely have a very similar talent level this year – good forwards and a mobile defense. Denver may have home ice and an extra exhibition behind them, but Notre Dame is a slightly more experienced and accomplished team, with a more experienced goaltender. I am predicting a 3-3 tie for the final score.